"Will You Be First to Flip Your Chips Into Emu's Mouth?" 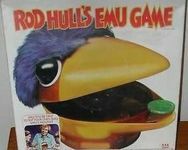 Rod Hull's Emu Game is a game for 2-4 players. In the centre of the game is a battery-powered Emu head which turns around whilst opening and closing its mouth. Players each have 10 chips which are placed one at a time on their flipper arm and are flipped towards Emu's mouth. The winner is the first to flip all 10 chips into Emu's mouth.